(September 2, 2001) -- A state Assembly committee has proposed stripping away LB's 38th Congressional district (currently represented by Cong. Steve Horn), moving it to the Fresno area, and making major changes to LB voters' representation in the U.S. Congress in 2002. 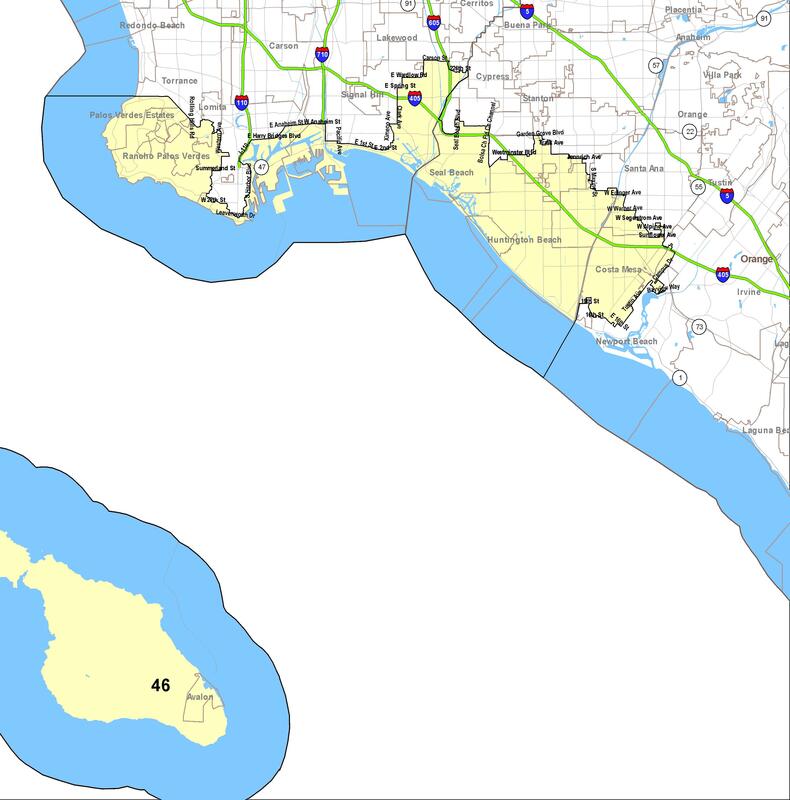 The Assembly Committee on Elections, Reapportionment and Constitutional Amendments has proposed new Congressional districts (maps below) that would put most of LB in a new 37th Congressional district that includes Willowbrook, Compton, Carson and most of LB including a sizable chunk of ELB. The 37th district is currently represented by Cong. Juanita Millender-McDonald (D., Carson). The new maps effectively reduce ELB's unified local voting strength in Congressional elections (i.e. 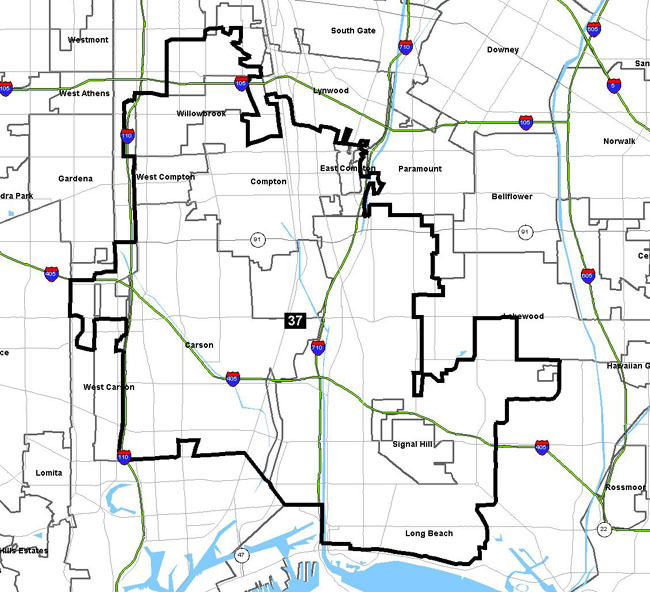 most of LB is in the 37th district but only part of ELB is). A sizable chunk of suburban ELB (east of LB Airport for about two miles, also north to old Lakewood Village) will share voters with Central LB, Compton and Carson. The rest of ELB (including Los Altos, Belmont Shore and El Dorado Park) is split from LB and becomes a relatively small percentage of the 45th district which stretches from P.V. to Costa Mesa. As of this posting, it's unknown if (or where) LB's current 38th district Congressman Steve Horn will run in 2002. 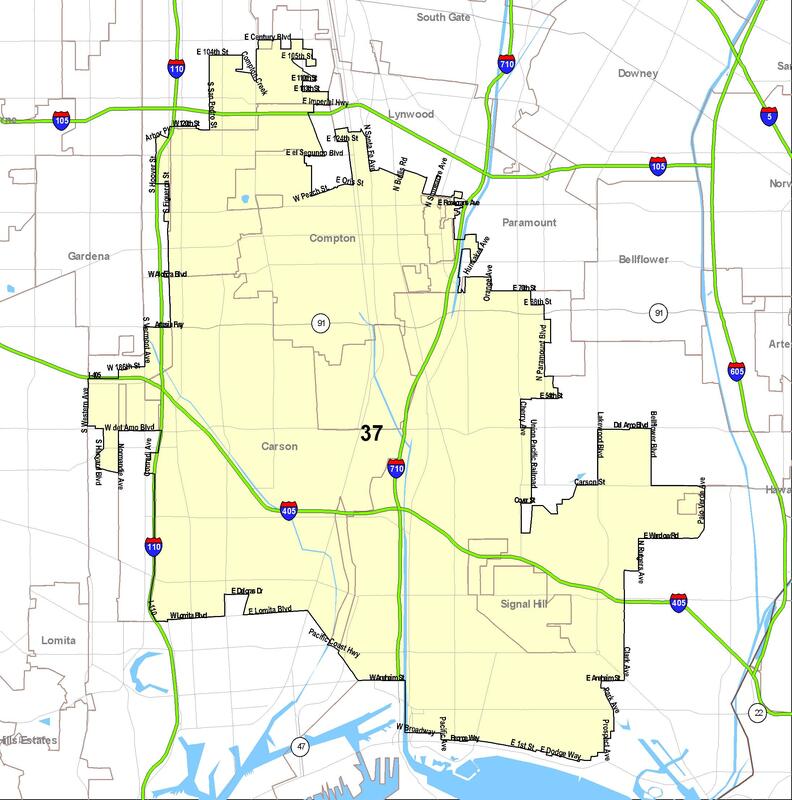 If he runs in the 37th district, he'd likely face incumbent Democrat Millender-McDonald in her Democrat district without much of his current district in ELB, Lakewood and Downey. If Horn were to run in the 45th district, he'd have to defeat incumbent Rohrabacher from his own party. In the November 2000 election, Horn narrowly defeated Democrat Gerrie Schipske by roughly 1% of the vote. Ironically, by erasing LB's 38th Congressional district, Assembly Democrats have likewise erased Schipske's LB Congressional hopes (unless she runs against Millender-McDonald or Rohrabacher). Although redistricting is constitutionally mandated to adjust for new census figures, deciding where district lines fall (while subject to some legal standards) is a highly politicized process, effectively controlled by the majority party in the state legislature at the turn of the decade. In the 2000 elections, California voters elected Democrats to a majority of state Assembly and Senate seats (and the Governor's office), so they control the process while Republicans cry "Gerrymander." In recent years, Republicans have repeatedly lost LB area state legislative elections (including races against former LB City Council incumbents). As a result, LB is now represented in Sacramento exclusively by Democrats, including Assemblymembers Alan Lowenthal, Jenny Oropeza, Sally Havice and state Senator Betty Karnette. The Assembly Committee proposing the maps (which includes former LB Councilwoman, now Carson-LB Assemblywoman Jenny Oropeza) will hold hearings Sept. 4-5 where the proposed maps may or may not be amended. The resulting maps would then advance like any other bill to the full Assembly and state Senate (also controlled by Democrats). If passed would become law if not vetoed by Governor Gray Davis or successfully challenged in court. They would take effect in time for the 2002 elections. For news advisories or advertising, contact Bill Pearl, publisher (mail@lbreport.com).